Included in this EP3 child Clone Trooper costume is a 100% polyester jumpsuit with realistic screen-printed details on the front and back in white, gray, blue, and black. 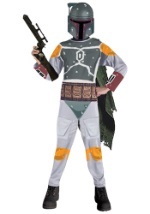 A pair of matching polyester/foam boot tops and a half-face helmet/mask also come with this officially licensed costume. Accessorize with some of our white, Clone Trooper boots and gloves to complete the authentic Star Wars look. You're child is sure to be a hit at any Star Wars theme party in this modern, Star Wars character costume!